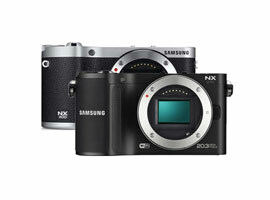 With six models in the range currently, Samsung offers largest choice of cameras of any of the mirrorless makers. Each model features WiFi connectivity built in, accounting for the firm’s choice of ‘Smart’ moniker but each model also shares a propriety APS-C size 20.3Mpix CMOS sensor. According to the firm this imaging sensor is notable for its large pixel structure resulting in more efficient light-gathering and higher sensor sensitivity, however detail is scant on sensor architecture. 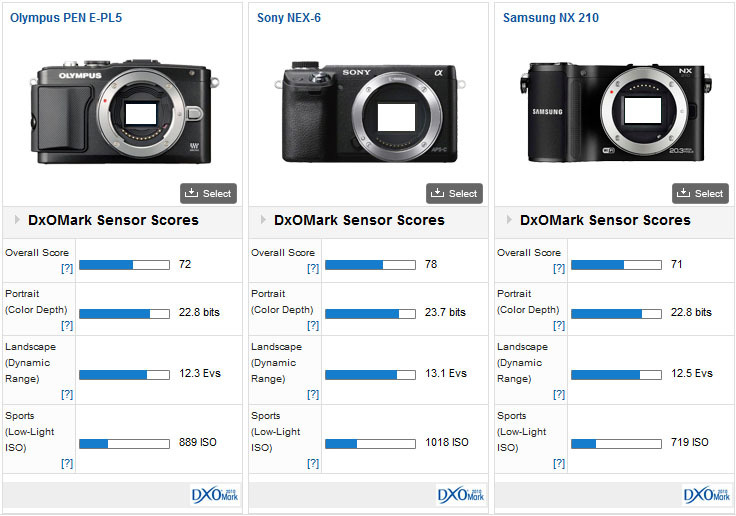 We’ve analyzed the performance of the mid-range $599 NX210 as well as the top-of-the-range $799 NX300. Among other features, this model adopts a slightly revised version of the sensor complete with an on-chip phase-detection AF pixel array, which promises faster autofocus even in low light levels. 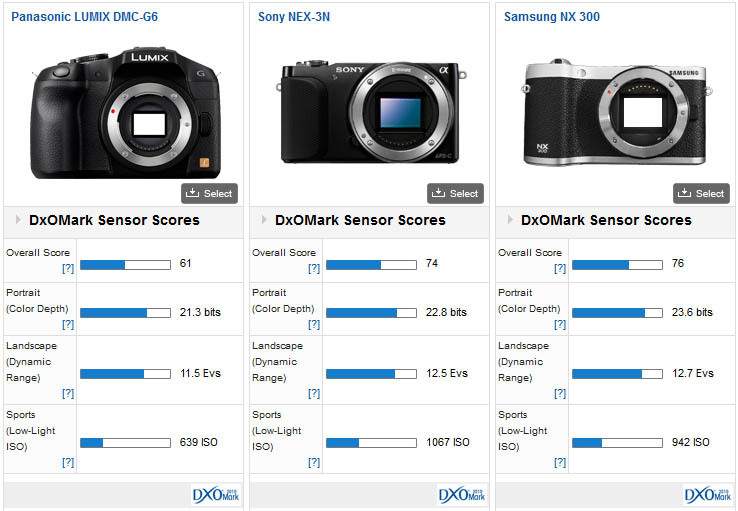 With a DxOMark score of 76 the NX300 falls just behind the $900 16Mpix Sony NEX-6 (scoring 78 in our benchmarking) with its similar size APS-C sensor. Despite the lower pixel count of the more expensive Sony, the NX 300 has similar Color Depth and Low Light capabilities but a slightly lower Dynamic Range of just under +0.5EV. Both cameras out-perform the smaller sensor in the Panasonic Lumix DMC-G6. In Dynamic Range, the NX300 has around a +1 stop advantage, dropping to +2/3 stop over the G6 in the Low Light score. However, the biggest gain to be seen is in Color Depth where the NX300 has a +1.5 stop improvement over the $750 Panasonic Lumix DMC-G6. As for the NX210, the DxOMark score of 71 puts it on a par with the similarly priced ($599) Olympus Pen E-PL5 at practically every metric, Color Depth, DR and Low Light ISO though behind that of the competitively priced ($500) Sony NEX-3N. While the Sony has similar Color Depth and DR to the Samsung, it has just under a ½ stop advantage in Low Light scores. Although the two sensors in the NX210 and NX300 have the same pixel count there are some obvious differences in their performance capabilities. From our previous test on the NX200, we can see that the NX210 adopts the same sensor unit and is in effect only a slight revision (adding WiFi along with some other promising functions). However, now the price of the NX210 has dropped to around $400 it’s a solid choice even if it can’t quite match the Sony NEX-3N at high ISO settings. The flagship NX300 is a different proposition altogether although it compares well with its peers and the promise of faster AF along with a number of high-performance primes means it shouldn’t be overlooked.